In a survey conducted by Economic Intelligence Unit of The Economist magazine, 80% of the top managers surveyed said that they would like to focus on adapting to the changing market needs and improve customer service. Almost 50% said that growing revenues was their second priority. These top managers also identified that the challenges to achieve these objectives is analyzing data to understand the changing trends and identify new opportunities. 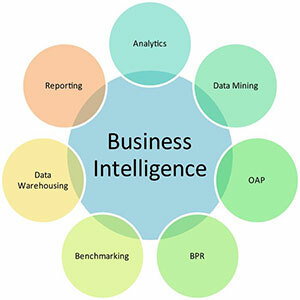 Business Intelligence tools enable corporates to analyze, aggregate and correlate their data. Most corporates have implemented one or the other Enterprise Resource Planning system. While an Enterprise Resource Planning system brings operational efficiencies in the business operations, they do not provide the necessary tools to analyze the data that is being generated from business operations. At best, operational reports can be generated out of the system. However to do advanced analysis of the data, a Business Intelligence tool is necessary. For e.g. if the corporate wants to analyze Supplier Performance and eliminate poor performing suppliers, it is simply not possible to do this in the ERP unless a number of software programmers and business analysts are engaged to bring out such a report. The ERPs are not designed to cater to such business requirements. A Business Intelligence tool, on the other hand, can create a simple supplier performance scorecard by accessing the data from ERP systems and using various tools to create the scorecard in a visually intuitive manner. The tool also provides the capability to drill-down into various dimensions to analyze where a specific supplier is underperforming. Or the tool can be used to understand why a supplier is performing optimally. There are many such examples. Analyzing Operational expenses, analyzing product line performances, analyzing customer demand are many such examples. Provides the Senior Managers the necessary information (data) to make effective business decisions. As against a Management Information System (MIS) solution, a BI solution is a Decision Support System. Faster access to data enables Senior Managers to find the answers to their business problems much quicker than spending time analyzing various operational reports. The BI tool provides the Key Business Metrics (Key Performance Indicators) whenever and wherever they are required. BI tools provide access to KPIs on a webpage or on a mobile devices. Business Intelligence tools provide great insights into customer behavior. Using BI tools, business managers can understand customer preferences (which products are bought frequently and through what channels) quickly, and hence can greatly enhance customer experience. BI tools also provide capabilities to analyze expenses and can bring in efficiencies in the business operations. Business Managers can analyze their top 5 spends and identify areas of bringing in cost efficiencies. BI tools can also monitor inventory and enable business managers to manage inventory much better. This will in turn ensure that the customers get the products when they want, but will also reduce the inventory carrying costs. BI tools enable CEO and top management to keep measuring performance against the set goals. This enables them to guide the organization to achieve their short term as well as long term goals. Centum Software is a young dynamic company set up in Noida, India. We focus on providing Business Analytics, Learning Management, Web Development services to our customers. We also enable and empower students from higher education institutions to learn new technologies and upgrade their skillsets, making them fit for corporate world. For more details, please visit our website : www.centumsoftware.com You can also contact us at: sales@centumsoftware.com Connect with us on Skypeid:centumsoftware, Twitter, Facebook and Linkedin. Join our community and stay updated on news and views in the changing world.